Intensely marbled beef that meets the rigorous standards for USDA Prime, and is the beef chosen by some of the world’s best restaurants. What makes meat Prime? It’s all about the level of marbling—a major indicator of tenderness. 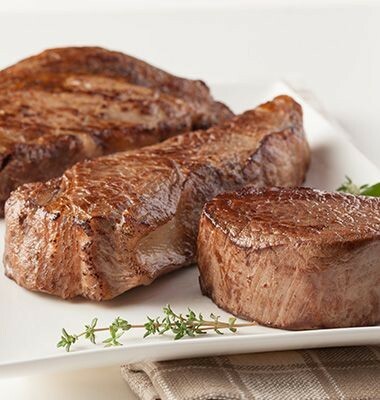 And our USDA Prime Black Angus is as tender as it comes. This intensely marbled beef meets the rigorous standards for USDA Prime—only two percent of the world’s beef makes the cut—and is the beef chosen by some of the world’s best restaurants. Yeah, it’s that good. Like all of our Black Angus products, we start with premium USDA-certified Black Angus cattle thoughtfully raised in the Midwest by select ranchers who produce exclusively for Rastelli and who adhere to our strict standards. Our cattle free range graze on natural grasses and are finished on vegetarian corn and grain feed, a process that adds to the rich taste of the beef by increasing the marbling and giving its unique flavor profile. The beef is then hand-trimmed and perfectly portioned by our trained butchers at our state-of-the-art, USDA-certified processing facility. 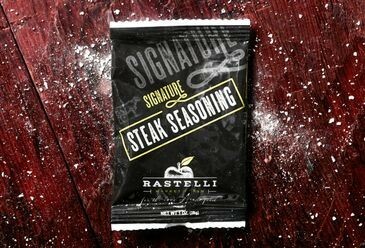 Some companies stop there, but at Rastelli we take it one step further, wet aging the beef in vacuum-sealed packages for a minimum of 21 days at controlled temperatures. This process enables natural enzymes to help break down the meat, making it tenderer and enhancing the flavor. Then we flash freeze the individually sealed steaks so you can enjoy them at the peak of perfection for up to 12 months. The result is a deluxe beef, so tender and marbled, finely textured it’s melt-in-your mouth good.